The major event for Sfinx was the Dan Andrei ALDEA's joining in 1967, at the time only a violin and guitar student at the music highshool, later to become singer and leader of the now recognised second-best ever Romanian rock group and to gain personal fame of musical genius. The band had a first large live audience succes in 1971 with the "Sir de cocori" song, which led them into writing the music for a film that was to be a masterpiece of Romanian cinematography, and consequently into long-term theatrical projects. In the end they managed to release the song as a single ("Sir de cocori / Languir me fais", 1972), then to release an EP ("Sfinx", 1974). Their first major hit was the "Lume Alba" ("White World”) full album from 1975; it shows various progressive rock aspects from the likes of NEKTAR, ELP and FUZZY DUCK, with some hard guitar riffs. Their masterpiece was to be the 1978 released "Zalmoxe", a concept album based on the archaic mythology of the Dacians. It's a true progresive rock feast, with great keyboard parts, all in the mood of GENESIS or MICHAEL NYMAN but with a great original touch. 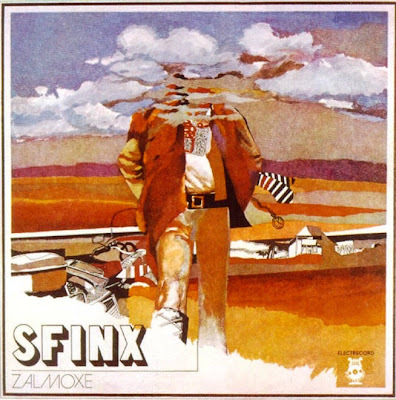 The album consists of studio recorded excerpts from the original live prog-opera "Zalmoxe" set up by ALDEA; the regime never allowed the band to release the whole show as it was suspected to be politically subvsersive. For the same reason, ALDEA's 1979 solo single was withdrawn from the stores, which led to his leaving into political exile in Germany after the band released two last singles in 1980 in the classic line-up . He never accepted the opportunity to reunite with Sfinx, even after the fall of Comunism. The band didn't give up and released a last full album in 1984, "Albumul albastru" ("The Blue Album”), more related to standard pop-rock then to progressive. The band still exists, but without any relevant public activity for over two decades now. The ALDEA period of SFINX represents, together with PHOENIX in the 70s, the greatest moment for Romanian rock and definitely a relevant moment for international progressive rock, highly recommended to progfans.